The Ottomans ruled much of the Arab World for four centuries. 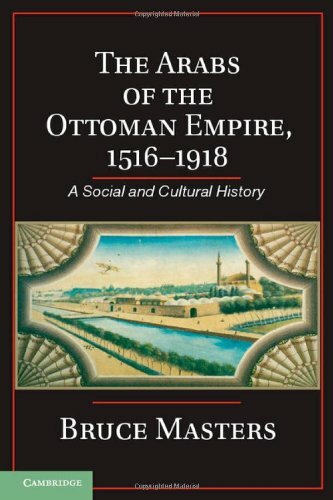 Bruce Masters's work surveys this period, emphasizing the cultural and social changes that occurred against the backdrop of the political realities that Arabs experienced as subjects of the Ottoman sultans. The persistence of Ottoman rule over a vast area for several centuries required that some Arabs collaborate in the imperial enterprise. Masters highlights the role of two social classes that made the empire successful: the Sunni Muslim religious scholars, the ulama, and the urban notables, the acyan. Both groups identified with the Ottoman sultanate and were its firmest backers, although for different reasons. The ulama legitimated the Ottoman state as a righteous Muslim sultanate, while the acyan emerged as the dominant political and economic class in most Arab cities due to their connections to the regime. Together, the two helped to maintain the empire.